Ronda Rousey, the UFC bantamweight champion was beaten hands down by Holly Holm in a shocking defeat which has stunned MMA fans world over. Winning Round 1 with scorecard reading 10-9 and fought very closely, it all went downhill Round 2 when Rousey was Knocked Out by Holm with a brutal and stunning head kick. Ronda was so badly hurt in the fight that she was not available for comments immediately and had to be rushed to hospital. Arguably the biggest star in Mixed Martial Arts (MMA) arena, she was outdone by a flawless performance from the former world boxing champion who very few believed was even worth of a fight with Ronda. A visibly overjoyed and relieved Holm was elated when giving post-match interview, and rightly so. Though she started aggressively, but many experts didn’t consider Ronda’s tactic to be too aggressiveagainst a seasoned fighter of 38 pro fights. Even before the first round got over, Ronda had blood, literally all over her face and seemingly very tired. Finally, the inevitable had to happen sooner than later – the perfect kick to end the bout on a style that only Holm would have done it! 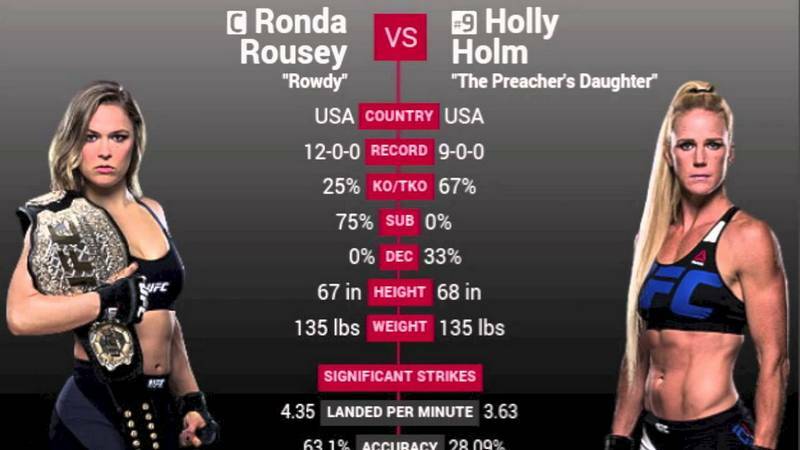 The animosity leading upto the match has also generated a lot of controversy, with the incident during weigh-in before the match – Ronda had accused Holm’s fist touching her face and the matter got so much heated up that UFC President Dana White had to step in to separate them. This was in core contrast to a calm Holm. Twitteratti, including Lady gaga were outraged with Ronda’s behaviour in not touching gloves with Holm in pre-fight, a customary practice. “THATS WHAT YOU GET FOR NOT TOUCHING GLOVES,” Gaga posted, in all caps, on Instagram. Considered an overwhelming favourite all throughout the lead up to this match, Ronda’s undefeated streak has been abruptly ended by Holm. This keeps Holm undefeated at 10-0 against Ronda’s 12-1 record. All eyes will now be on how Rousey rebounds from this humiliating loss and whether she’ll be able to retain that confidence heading into her next bout. Also, how other fighters would see her after this defeat and intimidate her is likely to be seen. Even Floyd Mayweather, whose relations with Rousey are not good and known world over (Ronda has even reportedly said that he doesn’t know him, in an utter disregard!) is reportedly overjoyed with the defeat.